News, recommendations, and other monkey business from Harvard Square's only independent children's bookseller, Curious George Books and Toys. This New Year's Eve we will be closing at 5 pm. We'll be open New Years Day from 12 to 6 pm. We wish everyone a happy and safe start to the new year! Looking for a reading group? Curious George is starting a new monthly book club for adults and teens. The first meeting, at 5pm on January 13th, will be a discussion of books we love and books we would love to read. The group as a whole will decide what we read for the following months. All ages and reading experiences are welcome, but we will focus primarily on young adult literature. 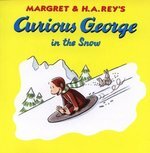 Curious George will discount each month's reading choice, which will also be available on our store's website. Call us at 617-498-0062, e-mail blog@curiousg.com, or comment on the blog to sign up or get more information. Come on in today to curl up with a book or stuffed animal! We are open until 7:00 PM. Welcome to my second round of holiday shopping help! This time, I'll be showcasing some of our year-round surest bets and hottest sellers. One of my favorite games to give is Bananagrams - all my friends and family have this! 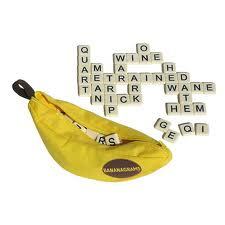 It plays like an individual Scrabble, where each person makes her own board of intersecting words (like a crossword). The tricky part is once a person uses all his letters and shouts "PEEL! ", everyone has to pick up another letter, which sometimes leads to reconfiguring your entire word board. I'd recommend this fast-paced game for ages 7 +, since spelling could be frustrating for younger children. Wha t small child doesn't go through a car phase? Sure, there's die cast cars, sturdy plastic construction trucks, and so on, but our absolute favorite vehicle gift is Automoblox. You can pull apart and rebuild these wooden cars and even interchange the pieces with other cars of the same size. My nephews have a bunch and they like to build one long giant vehicle! The styles range from old fashioned trucks to sports utility vehicles and race cars . I'd recommend these toys for ages 4 + for the small parts. This ye ar we started carrying a new line from Early Learning Co., the Happyland brand. Similar to Playmobil, these town and doll sets are brightly colored, safe for toddlers, and come with smiling, multi-cultural little people. 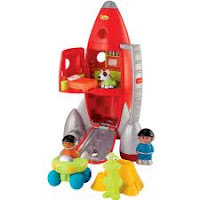 The most popular sets are the Flower Fairy House and Lift-Off Space Rocket, or the smaller sets of figurines, like Happy Family and Sunflower School Children. (Our book buyer has a set of the fairies in her office, but don't tell her I told!). Legos are, of course, a perennial favorite of any kid between 4 and 40 (I'm looking at my brother-in-law here), and Dorling Kindersley's Lego Brickmaster sets are fun, versatile, and more easily transported than some of the bigger tubs of Legos (though we do sell a lot of those, too!). 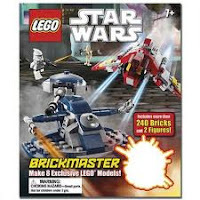 The sets are themed, with choices of Castle, Atlantis, and the ever popular Star Wars. I'd recommend these toys for about 6 +, depending on the set. 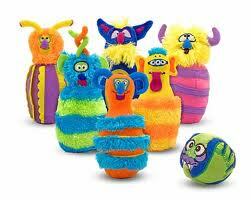 One of my favorite toys to recommend (and play with...) in the baby room is Melissa & Doug's Monster Bowling. Each bowling pin and ball is a different, friendly plush monster - perfect for playing with individually, or when toddling begins, actual bowling. This is a great gift for babies or toddlers with young siblings to play together. 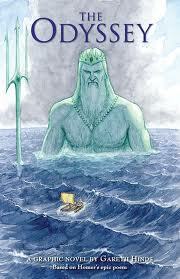 The Ody ssey by Gareth Hinds is a graphic novel retelling of Homer's epic poem. Staffer Shara recommends this title for ages 12 +: "Follow Odysseus through this graphic novel epic as he crosses oceans, traverses foreign lands (both realistic and fantastic), and confronts mythical creatures, gods, and men, in an attempt to return to his wife, Penelope. Hinds's genius use of color sets the mood perfectly for this grittily realistic adaptation." Mac millan's Square Fish imprint is in the process of reprinting Tove Jansson's classic Moomin chapter books with vibrant fresh covers. 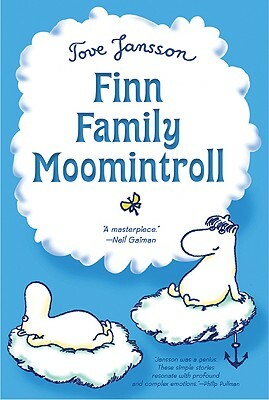 Staffer Natasha recommends Finn Family Moomintroll for ages 7 +: "The Moomins are a family of sweet Finnish trolls that like sunshine, pancakes, raspberry juice and adventures on the ocean seas. These books are weird (in the best way), funny and might remind you on Winnie-the-Pooh. Start with the 2nd book in the series, it's the best!" On NP R recently, author Gayle Forman picked Anna and the French Kiss by Stephanie Perkins as one of her favorite YA picks of the year, and I whole-heartedly agree! This coming-of-age romance is perfect for Sarah Dessen and Deb Caletti fans ages 13 +: For her senior year, Anna's successful writer father sends her to boarding school in Paris. Without knowing anyone or any French beyond "Oui! ", Anna struggles to fit in, until she befriends artsy Mer, "The Couple" Josh & Rashmi, and handsome (but taken!) Brit Etienne St. Clair. This novel shines with wit, the pains and sparks of first love, and the beauty of Paris. 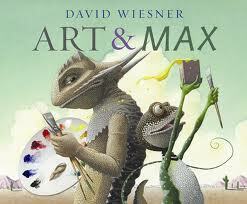 One of our favorite picture books of 2010 is from multiple Caldecott winning author and artist David Wies ner. This year's Art & Max is every bit as imaginative, humorous, and gorgeously painted as his previous books (remember the flying frogs of Tuesday, the cloud factory of Sector 7, or the mollusk castles of Flotsam?). Max wants to learn to be an artist like his fellow lizard pal, Art (who insists he is Arthur), but makes a glorious mess of things and must clean off and redraw Art. Mere words can't describe Wiesner's use of panels and references to paint greats like Jackson Pollock - like all art, you must see it for yourself. These are toys and books we typically carry throughout the year, but as always, it's a very busy season and we can only guarantee stock while supplies last. With the Festival of Lights beginning last night and Christmas advents being cracked, I can't believe it's already time to start crossing things off those wish lists. I've barely finished compiling my shopping lists! (Thankfully, my family doesn't follow this blog, so they can't see when I tell the world what I'm getting them...or that I still don't know what I'm getting them! Sisters are hard. That's all I'm saying.) Here, I've put together a few of the many gift ideas we've been recommending like hot cakes. Staff and customers alike get a kick out of Fred's food and pop culture blending toys. 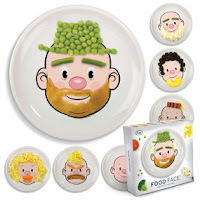 The ever popular Food Face Plate has returned - making mealtime with picky eaters playful and enjoyable for kids and parents. The plate has a friendly face that you can embellish, perhaps with mashed potato hair or a green bean mustache. You can order the plate from our website. Fred also gives us new cupcake molds: Tea Cup Cakes (oh the cleverness of you!) for princess parties, or swi vel-headed Yum Bots for space age sweets. The Fred folks are pun-y after my own heart: the "gearshaft green" bot on the packaging says "take me to your eater!". Try these for anyone from your teen chef to your sweet-toothed middle schooler. 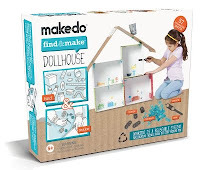 Austra lian company Make & Do have crafts after a true Cantabrigian heart: the Car and Dollhouse building kits provide the basic necessary tools and building plans, but encourage the builder to find reusable items around the house to complete the projects. 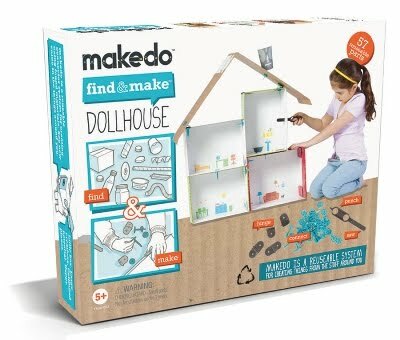 I'd recommend this toy for crafty kids 5 and up. 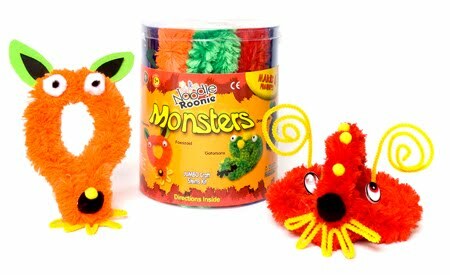 Crafter s will also love a new kit from Brain Noodles: Noodle Roonies! Brain Noodles have been extremely popular sold singularly or in boxed sets of 15 noodles, but now they make small themed kits, from Ocean Life to Creepy Crawlies. Each package includes brain noodles of course, with pom poms, googly eyes, foam pieces, and thinner chenille noodles. It's rumored that our book buyer Donna begged her sister, the toy buyer, to get these Twirling Batons from Schylling, because of her own love of batons. (She already has a set of weighted ones at home, or I bet she'd be tossing these left and right). Like jump rope, frisbees, and mancala, some toys never go out of style. These batons - with twirling tips included - are great for the athletic or girly elementary to middle school aged kids on your list. For the as piring musician or noise maker of the house, we have a variety of instruments, especially guitars. 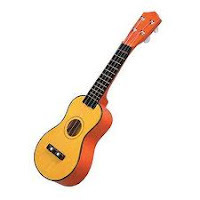 My favorite is the Woodstock Ukulele, which comes with a pick and song book. Of course, I do have family that lived in Hawaii, hence my partiality, but if you prefer the western twang, there's also the Cowboy Guitar from Schylling - pair it with a sheriff or cowboy hat and you're set for the best saloon act in town! We are stuffed to the gills with Legos, K'Nex, and Lincoln Logs, but my favorite block set for the wee toddler set is from Megablocks - the Play & Go Table can easily be folded up, carted about, and reassembled for architectural amusement anywhere. 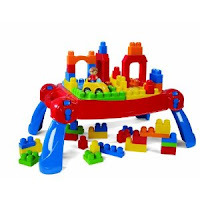 It includes base landscape pieces, various sized and colored blocks, figurines and cars. It's a whole block world, in your playroom. 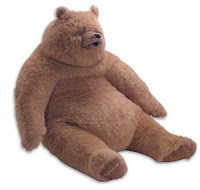 Speaking of stuffed, we have a new addition to our giant plush collection! We have an incredible assortment from Melissa & Doug to which we now add the Kodiak Bear from Manhattan Toy. He's even bigger than M & D's giant bear, with realistic looking, snuggly fur and a snout I can't help but mimic when I look at him. 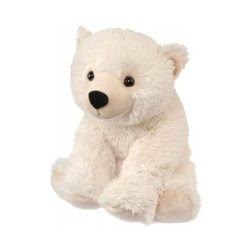 This bear is featured on our store's website, at a very competitive price. 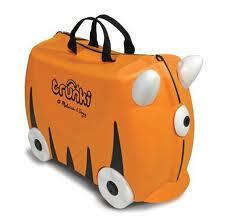 We've go tten many requests for rolling suitcases, and we're now proud to offer Melissa & Doug Trunki rolling trunks. These sturdy cases can be carried over the shoulder or pulled or ridden on. Leave it to Melissa & Doug to design a suitcase that is specifically engineered to handle what kids will want to do with their luggage. There are four vibrant animal designs, ranging from ladybug dots to tiger stripes (while supplies last, of course). The chapter book room hosts myriad board games from classics like backgamm on and parcheesi to Scrabble and Cranium, and of course, multiple chess sets. The newest and most creative I've seen is Wild Chess from Hansen. 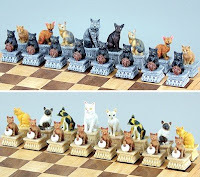 Instead of the typical conceptual castle-pawn-rook pieces, these are resin casted, hand painted cats versus dogs. 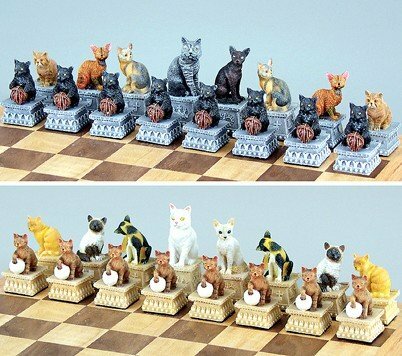 The dog's rook, suitably, is a bull dog, while the cat's queen is a Havan brown. Stum ped on stocking stuffers? Try out DCI's Ear Buds: these headphones come in funky styles you don't see in just anybody's ears: Babushkas (or Russian nesting dolls, take your pick), skulls, and strawberries. 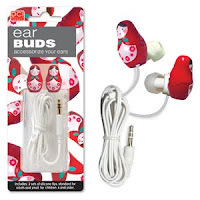 A bonus consideration: each package comes with two sizes in silicone tips, to fit either an adult or a child - or if you're sharing music in the car, both! NPR and the New York Times have each had some amazing lists of recent picture books and teen novels, so I will try not to overlap too much with their suggestions. (Except for Sick Day for Amos McGee, I cannot give that book enough attention!). Please check out their lists, we stock all of their recommendations (barring any publisher-out-of-stock issues). One o f the most frequently asked questions for picture books is "What do I get a girly girl who has every princess book there is?" When a 4-6 year old has every Fancy Nancy, Flower Fairies, and Rainbow Magic book there is, I defer to Princesses of the World, by Kateli Goyer, illustrated by Misstigri. These fourteen fairy tales tell of bravery, compassion, and, of course, true love, with fold outs of lush illustrations - and heavenly princess costumes. 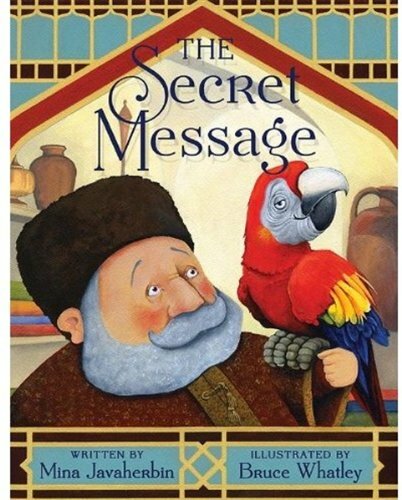 The Secret Message by Mina Javaherbin, illustrated by Bruce Whatley, will surely please anima l lovers, especially those who loved the zoo break-out in Good Night, Gorilla. 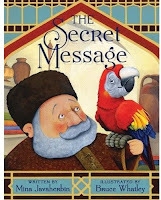 This story is based on a poem by Rumi: a Persian merchant's singing parrot attracts such attention to his goods that he must travel to India to restock his supplies. He asks his friends, family, and the parrot what they would like from India, and brings back cartloads of beautiful silks, jewels, and spices. The only one he can't please is the parrot - the birds there behaved very strangely when the merchant passed along the parrot's message, that the man doesn't want to tell his bird what happened. This story's moral is successfully warm without being overbearing. 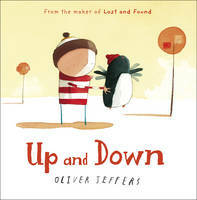 I was so e xcited to see that Oliver Jeffers has a second book out this year: this month, a sequel to Lost and Found. The boy and penguin friends return in Up and Down, this time to teach penguin how to fly. Their friendship is sweet without syrup (they play backgammon, of all board games), and the understated humor in both the writing and pictures is fresh upon multiple rereads (believe me, I'm on my fifth read already). I can't decide on my favorite illustration: is it the want ad poster saying "Ever dream of flying? Are you short and fat?" or the last page, "The two friends made a break for home," with the boy on stilts and the penguin pedaling a tricycle. You can order this book on our website. I ha ve a soft spot for wordless picture books: from Pancakes by Tomi DePaola, The Red Book by Barbara Lehman, or anything by David Wiesner, it's a talented artist who can tell a story with no words. South Korean Suzy Lee is no exception. 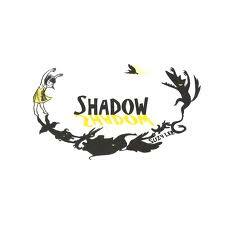 With her latest picture book, Shadow, she takes a simple vision of a girl making shadows to a new height of imagination and discovery, with only three colors: black, white, and yellow. The New York Times named this book one of their Best Illustrated of the year. Switching gears to baby books, it's always exciting to see new board book series. Jorge Uzon's Hello Baby series expand the baby photo niche beyond the Mrs. Mustards, Chronicle's Global Babies, American Babies, and the Starbright Where's the Baby flap books. Uzon's Not A Baby Anymore, Go Baby Go, and Look Around, Baby show expressive babies having their typical baby adventures, with witty captions. My top realistic fiction YA pick of the season is Conrad Wesselhoeft's debut novel, Adios Nirvana. Don't be deterred by the flaming guitar cover: this is not your average angsty teen story. Jonathan is a poet (I love the Walt Whitman quotations! ), skater, guitarist, and one half of a twin. Ever since he lost his brother, Telly, last year, Jonathan has been floating through life with his Thicks and frozen vodka grapes. By turns heartbreaking and hilarious, you will cheer for and shout at Jonathan as he slowly wakes to the world again with the help of a medley of strangers, including Eddie Vedder and the most beautiful guitar in the world. Dystopia n literature, as you may have heard, is all the rage this season. 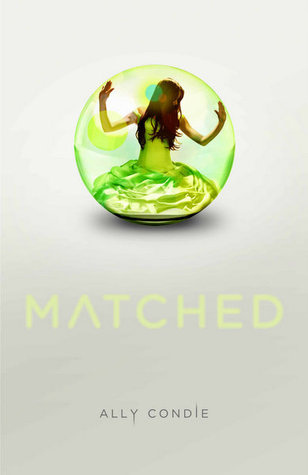 Matched by Ally Condie may have a more romantic pretense, and much less graphic violence, than The Hunger Games, but it can go head to head with that dystopian heavyweight in terms of suspenseful pacing and socio-political discussions. Cassia's world is made safe and productive by the Society: husbands and wives are matched for healthy offspring and jobs are chosen for workers by efficiency and intelligence levels. When Cassia's Match turns out to be her handsome best friend, Xander, she's ecstatic - until a computer glitch shows her another man's face, and opens her mind and heart to other possibilities. Not only fans of The Hunger Games, The Uglies, etc, will like this novel - the building romantic tension and pressure of choosing who to love - will appeal to Twilight fans as well. This year was very good for middle grade - I liked a surprising number of stand-alone novels. Cynthia Lord's Touch Blue is one of my favorites, with such a loving description of island life in Maine you can practically smell the salt air and hear the clatter of lobster traps falling on boat decks. Tess's small island will lose its school - and thus her mother's job - if their child population doesn't increase, so families take in foster children, which turns out to not be as simple as playing Monoply together. Tess is a wonderfully fresh character, with a mix of confidence, humor, and vulnerability, and a pocketful of lucky charms. As the holidays progress, we'll share more of our favorites with you, but as always, things sell fast! Toys and books are only guaranteed as supplies last. 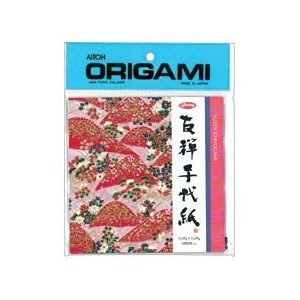 A customer came in recently and picked up a couple packs of our gorgeous origami paper from Aitoh. He told me he was working on a project, working with a handful of other people to make 1,000 paper cranes for the children's wing of a local hospital. A gift of 1,000 paper cranes, it turns out, is supposed to bring luck, and some say brings with it the potential for a wish...whether for long life, happiness, or good health. Perhaps for a single person, 1,000 paper cranes is a lofty project. But it struck me what a fun, creative and beautiful craft origami could be for the holiday season. Imagine hanging brightly colored cranes, frogs and stars from your Christmas tree, or stringing a couple dozen paper creations together to form a colorful garland. You could even get together with some friends for a cozy night of hot cocoa, snacks, and origami, and celebrate the holiday season with good company and hands on craftiness (and maybe even a few shared holiday wishes). Aitoh's beautiful origami paper is located downstairs in the chapter book room, and comes in a variety of colors and patterns, including metallic and color mesh designs.